I wasn’t intending on sharing this meal as a recipe post as it was my own Christmas dinner and an experiment of sorts. You see, It was my very first ever attempt at a nut roast and while I concede that I could have done a few things differently, I thought it came out rather well. So I plated it up, quickly snapped a couple of photos and here you have my Wild Mushroom and Nut Roast with Jamie Oliver’s vegan gravy (minus the Marmite). Does anyone really like that stuff? I served it up with freshly steamed green beans and homemade mashed potatoes. I make mine very simply, with vegan margarine, almond milk and seasoned with salt and pepper. But let’s take a step back to where this idea all began. Chestnuts. My local grocery store had a huge basket of whole, fresh chestnuts on display and I couldn’t resist. Had I ever even seen a chestnut before? Nope. But it looked fun, so I bought a pound of them. I immediately got on YouTube seeking a way to roast these (not over an open fire). There are many varying opinions on the best way to roast these, but I decided the one that made sense to me was to soak for 2 hours in water, drain, and score with a very sharp serrated knife. This sounds easier than it is and quite frankly, was where the romance of roasting at home began to fade for me. I also found that there was a fine line between perfectly roasted chestnuts and well, chestnuts that were either not cooked enough or cooked too much. Grrrr… The ones that peeled, peeled perfectly! And can I just mention how rough this was on my fingers? In the end, I wished I had just purchased the ready to eat chestnuts. Live and learn. 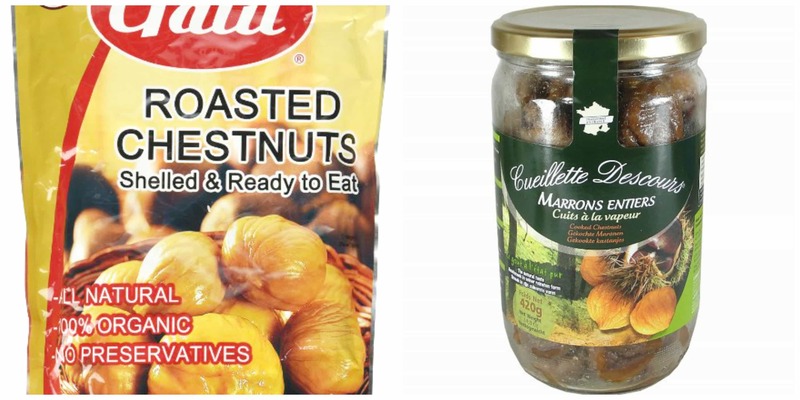 While I must admit, purchasing vacuum-packed or jarred ready-to-eat chestnuts is not nearly as nostalgic and/or romantic a notion as roasting your own, I highly recommend this option. At least you won’t burn your fingertips trying to peel them 😉 If you can’t find them in your local or specialty grocery store, I found many to choose from on Amazon. 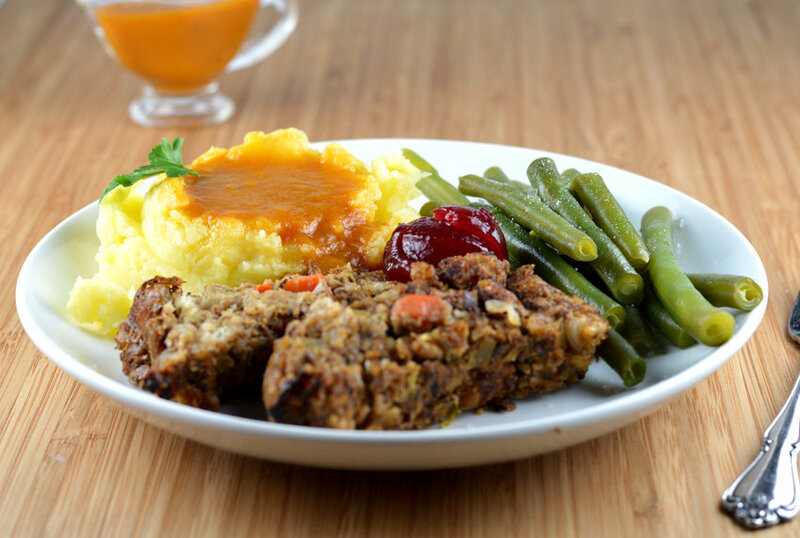 My recipe for this nut roast very closely resembles a chestnut mushroom stuffing. You can certainly get creative and use your favorite ingredients here. Onion, celery, leek, mushrooms, chestnuts, walnuts, a little white wine, vegetable broth and of course, seasoned cubes of bread. I save the last few slices of loafs, cube them up and freeze until I need them. Once at room temperature, just place in the oven on low heat to dry them out. I used a flax meal mixture as a binder which also adds to that nutty flavor. FOR THE GRAVY - There is a link to Jamie Oliver's recipe in the recipe post. I omitted the Marmite and reserved the vegetables after straining to add to my nut roast. Prepare the vegan gravy (link to Jamie's recipe in the post). In a large saute pan, melt the vegan margarine and add the onion, celery and leek. Add the herbs. Saute until almost tender. I also added the reserved vegetables left over from straining the gravy. Add the white wine and cook until the alcohol burns off. Remove from the heat and stir in chestnuts and walnuts. In a large bowl, add the breadcrumbs and transfer the nut mixture as well. Add the flax meal mixture. I like to heat the broth and slowly add to the bread cubes just until moistened. Do not add too much or this roast will not set, nor will it slice. Evenly distribute the mixture among mini loaf pans or muffin cups that have been prepped with cooking spray and press to compact. Bake for 20-40 minutes depending on the size of the pans. Allow to cool in the pans for at least 5 minutes before removing. 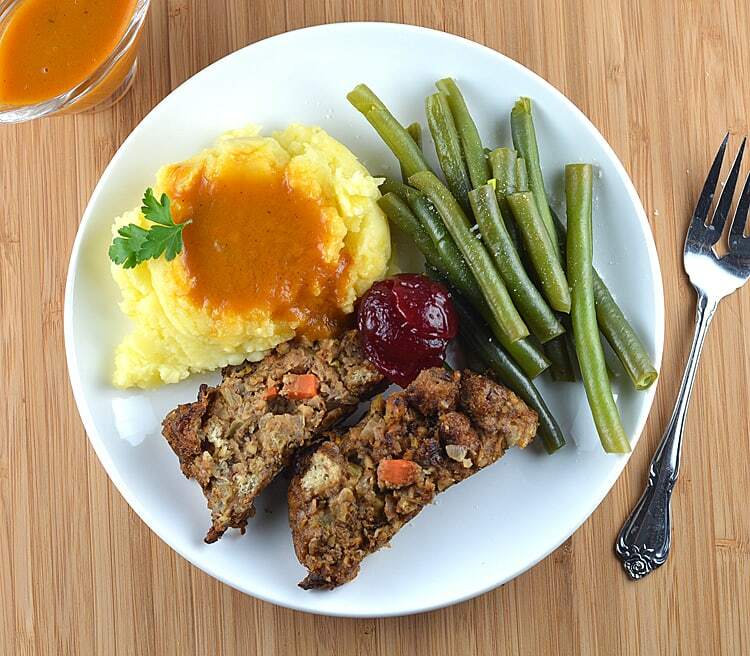 Much like a traditional meatloaf, these firm up as they cool slightly. 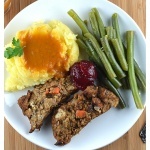 Top with the vegan gravy and serve with mashed potatoes and a vegetable, such as freshly steamed green beans. How much breadcrumbs are used? Hi Teresa, I just re-read the instructions and realize I said ‘crumbs’ but meant cubes. I edited the recipe, so I hope it’s a bit clearer. I used about 2 cups of cubed, dried bread in this recipe. Sorry about that! The recipe makes enough for a standard loaf pan, but I found that the smaller, individual loaves or even muffin-sized set up better. It looks great! And certainly sounds filling! I was wondering whether I could replace the bread with something else. My husband does not eat gluten… Otherwise I like the sound of this recipe. Hi Shirin, you could definitely use a gluten-free bread! I cannot think of anything to substitute it completely though and have a similar result.